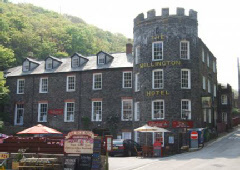 A fair few of Britain’s nobility have rested at “The Welly”, including King Edward VII. But arguably the most renowned figure to stay at the hotel is Thomas Hardy. Indeed, Boscastle’s connection to the creator of Far From the Madding Crowd and Tess of the d’Urbervilles is rather under-appreciated - it was here that he first met his wife, Emma Gifford, while restoring nearby St. Juliot’s Church. Moreover, Hardy’s third book, A Pair of Blue Eyes, gains much of its inspiration from the striking scenery around the village. Other famous guests include the acclaimed Victorian actor, Sir Henry Irving, and one of Britain’s greatest military heroes, Guy Gibson VC (leader of the World War II Dambuster’s raid) who once described the Wellington as his “favourite hostelry”. Those staying in Boscastle will find plenty of places to visit in the immediate vicinity, with famous sites such as the castle at Tintagel just a short drive away.